Courtney Day, Hybrid Hunnyz Model and discovered 1st by Team Hybrid. Congratulations to our Hybrid Hunnyz whom we discovered first, Courtney Day for making Import Tuner 10th Year Anniversary Issue (December 2008, pg. 085) in the feature article titled, "The Decade Revisited. Our Ten Hottest Models and The Most Significant Landmarks." 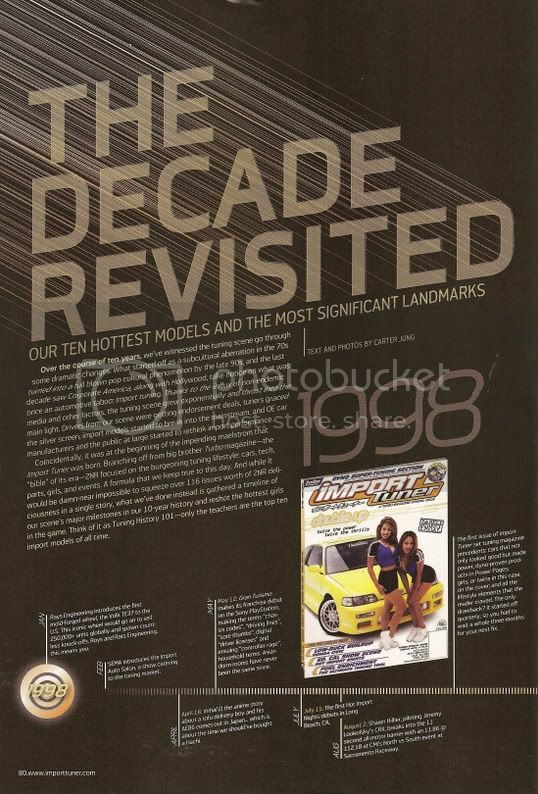 Can you believe our team is older than Import Tuner which released its first issue in 1998? Can you believe our team is working with or worked with 3 out of the 10 hottest models of the decade? Can you believe our team (thanks to Tom Ngo) is responsible for discovering 1 (Courtney Day) out of the 3 models whom we worked with and Import Tuner believes is 1 out of the 10 hottest of the decade? Lastly, can you believe we are going to be partying @ the Import Tuner 10th Anniversary Party later toinght and we are the main attraction with our display of cars & Hybrid Hunnyz on the go go for the event? Since IT 10th Anniversary issue is in GOLD, maybe tonight @ the party, I will release the never seen before GOLD HybridHunnyz.com outfit. is courney retired now? i don't see her anymore like i used to.